Aspr Surd has devoted thirty-three years of his life to a crusade to establish an international university in Avezzano, Italy. A Foreign Capital Investment and Its Law documents his efforts and frustrations. The book consists of documents written between 1967 and 2000. They include letters, proposals, memorandums, explanations, and personal recollections and reflections. Many are directly focused on the effort to establish a learning institution in Italy modeled after Case Western Reserve in the United States. Other documents concern different projects—a mine, a hospital, a factory—that developed during the time Surd pursued the university project and related litigation. Approximately halfway through the book, a chapter titled “The End of the Case” summarizes the university court case and its background. This chapter will be useful to readers who are overwhelmed by the detail of the documents contained in previous chapters. 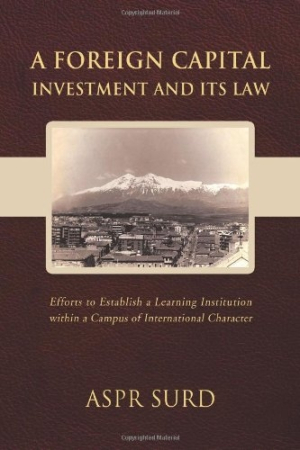 The second half of the book focuses on other international projects and on continuing complications in resolving the court case regarding the Campus of International Character identified in the book’s title. Because of its subject and format, A Foreign Capital Investment and Its Law will appeal to a very limited audience beyond the people directly involved in the failed project. The author’s lengthy explanation of international law regarding overseas investment by Americans also may be of interest to business or law students; the main point of the book is that international laws are not enforced on either side of the Atlantic, leaving honest investors the prey of corrupt individuals and governments. However, the distinction between written and applied law could have been demonstrated more succinctly. The author’s decision to include thirty-three years of documents related to the university project results in needless repetition of background information and may try the reader’s patience. The back cover describes the book as a “scholarly work.” Although the use of passive voice may suggest an academic approach, the book lacks the documentation that is the cornerstone of scholarship. Quotes are unattributed, and sources in the text are vaguely described as “somebody in town” and “a distressed councilman.” The book does not include a bibliography. It is also missing documents that would allow the reader to make a fair judgment of the author’s claims. The author believes that certain newspaper articles misrepresented the American University project and maligned his or her reputation. However, these articles are not presented in the book. The author’s identity is also a mystery. The book includes chapters on law, economics, higher education, and mining. Is the author personally fluent in all these areas? Without the support of credible sources or the strength of proven personal expertise, a careful reader is unlikely to accept the author’s conclusions no matter how passionately they are presented.